Neighborhood Meets & Bounds – Survey – Exhibit A – Legal Description Per Seller Survey – The North 3.67+/-. Courtesy of R.L. Wood & Company, L.L.C. REDUCED! Secluded yet close to everything important. PLEASE SEE – aerial photos, 2 – Matterport Floorplan-Dollhouse & Vacant View in Virtual Tours, Photo’s under the Photo TAB. Perfect for a residence/retreat whether personal/ corporate. Has Horses set-up (EZ take down if not wanted). Surrounded by many 1,000’s of acres with unlimited miles of hiking/biking/riding trails, splendor of the High Sonoran Desert with all flora & fauna, 360 Views of mountains & valley (day/night) with spectacular vistas of the East Valley, along with stars, stars & stars. Enjoy wildlife: Quail, Doves, Roadrunners, Blue Jay’s, Cardinals, Eagles, Hawks, Deer just to mention a few. This home has many designer touches. Custom wall/paint highlight the seller’s furniture & tastes. See Listing & MORE information. 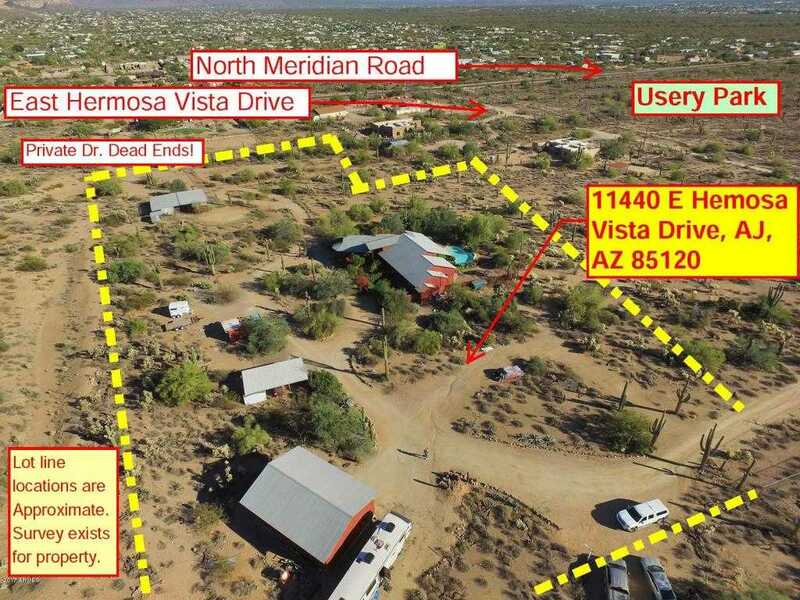 Directions: N on Meridian Rd from Brown Rd to Hermosa Vista Dr. (1/2 mile N. of McKellips Rd – Go W. on Hermosa Vista Dr. just N. of Maricopa County Usery Park)- follow signs ”PROPERTY 1” to property. Full floor update in 2002. Full wiring update in 2002. Full plumbing update in 2002. Full heating and cooling update in 2002. Full roof update in 2002. Full bathroom update in 2002. Full room addition update in 2002. Approximate size: 159865.00 sq. ft.
Subdivision: Meets & Bounds – Survey – Exhibit A – Legal Description Per Seller Survey – the North 3.67+/-. Please, send me more information on this property: MLS# 5690117 – $719,800 – 11440 E Hermosa Vista Drive, Apache Junction, AZ 85120. I would like to schedule a private showing for this property: MLS# 5690117 – $719,800 – 11440 E Hermosa Vista Drive, Apache Junction, AZ 85120.